At Sunny’s Pools & More, we are giving away a Treasure Garden Cantilever Umbrella to one lucky winner! Sunny’s Pools & More is your number one resource for all your patio furniture needs. To prove this, we will give away one of the industry best umbrellas to a lucky winner. You will have to hurry, the contest is only valid until September 15, 2018! All entries must have a valid email address with phone number to be contacted with. The winner will have the option for a 9 foot, Auburn, Olive or Sand colored umbrella with a bronze frame. A base stand that can hold up to 225 lbs. is provided as well. Prize package has a $494.75 value! The Cantilever umbrella is one of Treasure Garden’s most popular umbrella collection. The design of the umbrella provides 360° of shade. Also, with such flexibility in the design, you can angle the umbrella any direction so you are always in the shade. In addition, these umbrellas are built with durable materials that will last you and your family for years to come. One of the great features of this umbrella is the stand is designed to stay out of the way. Most traditional umbrellas run through the center of your outdoor table. With a Cantilever, it stays back and out of the way, this lets you freely move the table without the hassle of moving the umbrella as well. 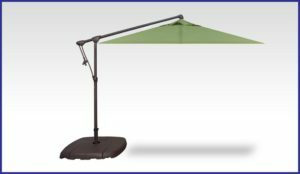 When purchasing a Cantilever Umbrella, there is a wide variety of fabric materials and colors you can choose from. Luckily, the experts at Sunny’s Pools & More have extensive experience with patio furniture and umbrellas. Of course, we also carry a large line of other umbrellas as well and an extensive line of patio furniture. We can answer any question you may have, visit one of our great locations today! For rules and regulations on our contest, please click here.